Some of the new Barbie doll faces for the years 1963 to 1967 are; molded hair Fashion Queen and Miss Barbie, Barbie ponytail with swirled hair across the forehead, Barbie American Girl hair, Color Magic with hair that changes color, a whole new up dated more youthful Barbie 1967 twist n' turn with long straight hair and bangs and Barbie Fair Hair a replacement head with a short bob. 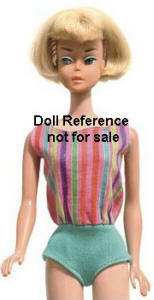 See below for full descriptions, photos and markings to identify each new doll style. Barbie doll markings are found on the right side buttock, the trademark date is the first date of patent or copyright in the country of issue or manufacture. 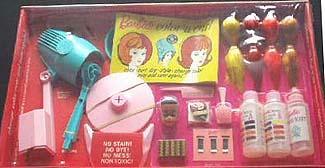 Molded head, brown hair, blue headband, three wigs, Midge and Barbie markings, straight non-bending legs, painted facial features, swimsuit is one-piece gold lame` and white striped with a matching head scarf or turban. Gold lame` swimsuit, matching turban, pearl earrings, white open toe heels, black wire stand, wigs; blonde, brunette, titian. Doll mark: Midge T. M. © 1962 Barbie ® © 1958 by Mattel, Inc.
Add "Patented" to Marking. Rest same as 1963. One molded head (similar to Fashion Queen), brown hair, blue headband and three wigs. No bangs, side-swept ponytail, several hair colors; ash blonde, auburn red, dark brunette, platinum white, straight non-bending legs, painted facial features. Same red helenca swimsuit as the 1962 bubble-cut, red open toe heels, pearl earrings, gold tone stand. 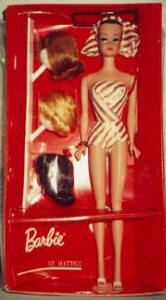 The ponytail Barbie platinum hair color swirl, is rare or harder to find. Shown with her box at left, is a blonde swirl Barbie #0850. Late issue 1964-1965 had the word "Patented" added to the last line in the marking. First open and close sleep eyed Barbie doll, molded brown painted hair, orange painted headband, also the first first bendable leg Barbie doll. This doll actually frighten children thus it did not sell well, but is highly prized by collectors today. The marks on her upper forehead are very common and are melt marks from her wig being left on over the years. Doll mark engraved: © 1958 Mattel, Inc. U.S. Patented U.S. Pat. Pend. On back of head: © M. I. Pink one piece swimsuit, orange hair band, swim cap, light pink open toe heels, three wigs, wig stand, lawn swing, plant, magazines, transistor radio, purple princess phone, tray, glasses, gold wire stand. American girl classic page-boy hair-style in a short version or longer, also the rare side-part styles, various hair colors, one piece swimsuit of solid turquoise blue bottom, multi-striped top, doll has bendable legs, painted facial features. 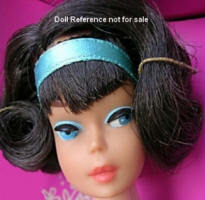 You may also see this doll referred to as having High Color = HC or more intense makeup coloring. Same marks as the Miss Barbie doll. Striped swimsuit, turquoise open toe heels, gold wire stand. Doll mark: (Raised) © 1958 Mattel, Inc, U.S. Patented U.S. Pat. Pend. 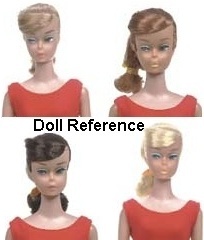 American girl doll Hairstyle: Classic short pageboy on top row in titian, blonde - bottom row; silver brunette, blonde and ash blonde. Not shown is the shorter pageboy in dark brunette. See the 1070 Barbie doll, side part American Girl shown on left, so you can see the thatched rooting pattern in the part. Same as above minus the Midge head, same packaging as below photo 4039. 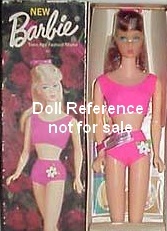 Long straight hair, (midnight or Golden Blonde) no bangs, hair changes color with the "color changer solution", bendable legs, painted facial features, one piece harlequin diamond swimsuit and headband. Doll mark: © 1958 Mattel, Inc. U.S. Patented U.S. Pat. Pend. (raised) Made in Japan. Later issue has all marks in raised letters. Diamond print one piece swimsuit, headband, tie belt, bobby pins, hair ribbons, blue tulle hair tie, A/B color changer, sponge, gold wire stand. New box, rest same as late issue 1966. New updated head-mold, more youth-full. Twist and turn waist, bendable legs, long straight hair, straight bangs, salmon hair ribbon, rooted eyelashes, two piece salmon vinyl swimsuit, white net cover-up with salmon accent. Five hair colors: Chocolate Bon-Bon (darkest brunette), Sun Kissed (palest blonde), Go Go Co-Co (brown or brownette), and Summer Sand (ash blonde). Note: the Titian hair color has also been found, but not very often. New posing stand - clear plastic, turn it over it's a seat for the doll. Doll mark: © 1966 Mattel, Inc. U.S. Pat. Pend. Made In Japan. Orange two piece vinyl swimsuit, nylon mesh cover-up, orange hair ribbon, clear X stand. 1162 Barbie Twist N Turn, Mattel did a trade-in promotion - for a $1.50 plus a prior Barbie doll, they sent in return this new Twist N Turn Barbie with a model # of 1162. Some of the 1162 Barbie trade-In dolls have "Made in Japan" on one line on the markings, otherwise everything is the same as the 1160. New swimsuit, pink with green knit top, rose vinyl shorts, twist and turn waist, bendable legs, real eyelashes, painted facial features, rest same as 1967. Swimsuit, green belt, X stand. New swimsuit, one piece bright colored checked, yellow band around neck, new hair-do changed to a long flip often referred to as the "Marlo" Thomas doll, rest same as 1968. New one piece rose and white pattern swimsuit (shown at right), rest same as 1969 including the "Marlo" flip hair-do. New centered eyes, one piece striped swimsuit red, yellow and hot pink (shown at left), rest same as 1969-1970 including the "Marlo" flip hair-do. Non-twist waist, painted eyelashes, painted facial features, two piece pink swimsuit with flower accent on bottom, same hair style as #1160 of 1967, pink Swimsuit, clear X stand. The Barbie Inland Steel gift set used the above shown 1190 Straight leg Barbie in her two piece pink swimsuit, blonde, brunette or redhead long straight hair, wearing a unique silver cardboard drum shaped over dress, modeled after a futuristic Paco Rabanne design. This is thought to be a mail in promotion, as all dolls have been found to date in brown cardboard mailers with plain white insert boxes. Same markings as above 1190 Barbie doll. 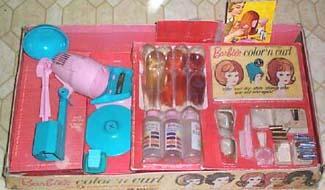 This gift set was sold in a very limited amount, it's unknown exactly how many gift sets were made and sold, but at least four have come to auction, in the above mentioned hair colors. #1592 Twinkle Town gift set - The 1190 Barbie is dressed in a two piece blue swimsuit (exclusive to this set), blue hair ribbon, has painted blue straight ahead eyes, is the only TNT doll with platinum blonde hair color and it included the # 1866 Movie Groovie outfit. Same markings as above 1190 doll. 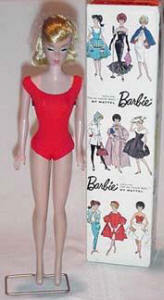 Midge™ © 1962 Barbie ® © 1958 by Mattel. Inc. Patented. New one piece rose and green swimsuit with flower accent on bottom and new box, painted eyelashes, same markings and the rest as 1969. New centered eyes, rest same as 1970. This doll, plus an outfit were offered by the Chef Boy-Ar-dee Company as a promotional item. 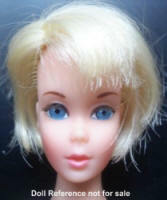 One Barbie unmarked head, side glancing blue painted eyes, short rooted hair blonde or brunette, real rooted eyelashes, hair pieces and accessories. 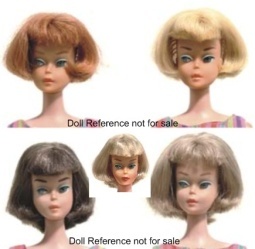 Note: The Fair Hair Heads were sold as a replacement head, wigs and hair pieces and were never sold on a doll body. 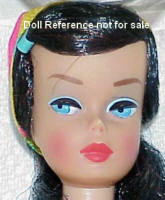 One Barbie unmarked head with short rooted hair in Blonde or Brunette, side glancing painted blue eyes, real rooted eyelashes, slightly different accessories than the prior sets. One Barbie unmarked head, also with centered eyes. Rest same as 4043.